Welcome to two weeks of Halloween ideas and inspiration and to kick us off is this lovely modern Halloween tablescape inspiration of the day! We always have a soft part in our hearts for a monochromatic color scheme, especially black and white and we are definitely loving these white painted pumpkins. Even the stems are just so awesome. We also love how they go so well with the milk white chairs and off black table. 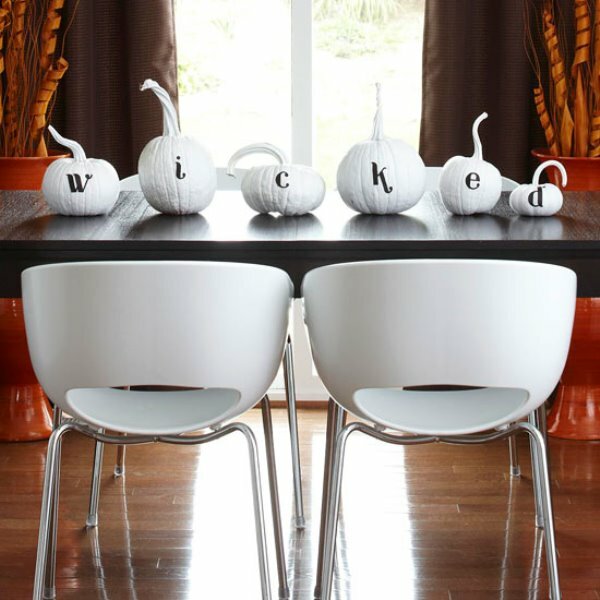 These pumpkins are definitely wicked! We aren’t sure if the letters are painted or if they are stick ons but either way they are lovely! We love this for a DIY Halloween project too. It is super easy yet it turns our so chic! This is a fabulous Halloween tablescape!